How can I draw the three intersection circles/ellipse with that shading paradigm (not necessarily the same colors) effectively? It appears that the original image doesn't have overlapping colors whereas I do. 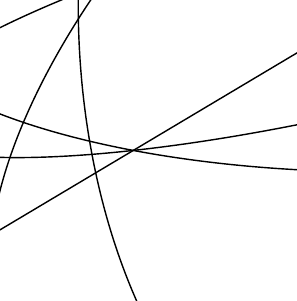 Is there a better way to construct the drawing of the circles/ellipse than what I have done? 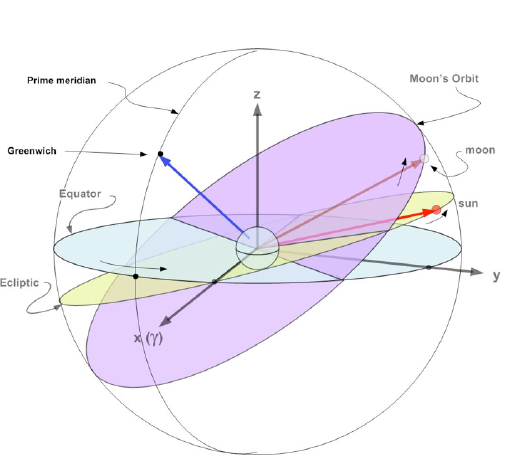 and ecliptic plane with the x axis ray? How can I clip the circle at the origin out the all the filldraws so the blue sphere isn't over come by the background colors in it? Also, how can I create the curve arrows to the point? I know I can use controls, but my control curves never look close to that. 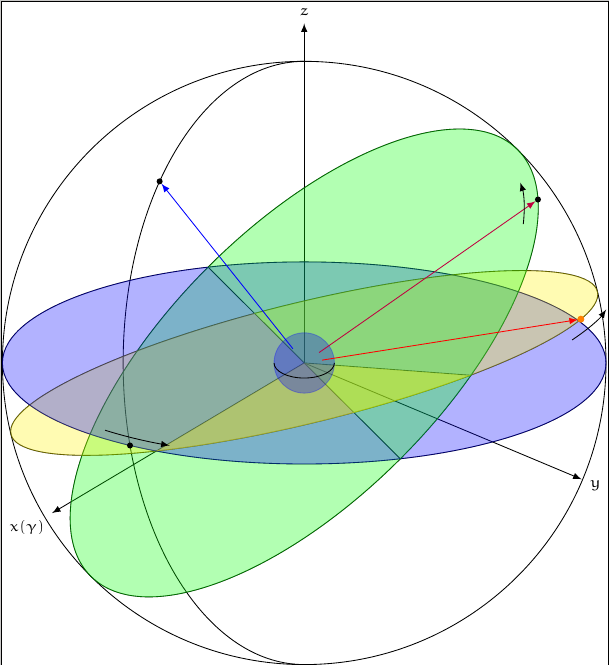 When adding in the axis, I had to fiddle with the angle of ecliptic plane in order for the equatorial and the ecliptic plane to intersect at the x axis. However, this cant be precise just close. Here is what I have now. The clips are really sloppy but I couldn't figure out a way to clip the area concisely. We can see the intersection looks good, but unless I am extremely luckily, it isn't precise. An alternative way to make complex 3D representations is to use TeXgraph. TexGraph is a software assisting in the creation of mathematical graphs in the form of orders, and to export as text files in various formats: LaTeX (eepic macros), or pstricks or Pgf / Tikz (pgf macros), or Eps or PSF (eps + pSfrag) or pdf (eps conversion -> pdf) or svg ... There are also specific export to 3D. Not the answer you're looking for? Browse other questions tagged tikz-pgf 3d shading or ask your own question.